Happy Independence Day! Our boys will be sporting these adorable hand painted t-shirts. I saw these online and knew instantly that this was a craft for us. Forgive me for not giving credit to the blogger who shared these. Unfortunately, I can't find the original inspiration (how could I not have pinned that?!?). Because of this, we painted these shirts with no instruction. Tear off a large piece of freezer paper from the roll. Insert it shiny side up inside the shirt. With an iron on medium heat, iron the front of the shirt. The heat will make the paper temporary attach to the shirt. This step will prevent the paint you're adding to the front of the shirt from bleeding through. 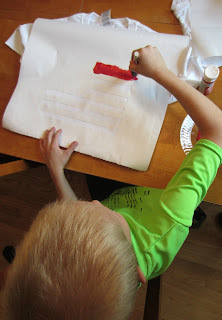 Now on another piece of freezer paper, draw and cut out long rectangles that when painted will become the red stripes on your flag. Remember to leave a blank space for a handprint. Position the freezer paper stencil on the front of the shirt. Iron it in place, shiny side down. 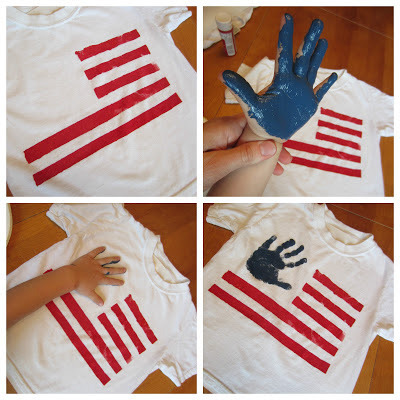 Now use red fabric paint and a sponge brush to apply the paint to the stripes. Any paint that is applied on the freezer paper will not bleed through. When the stripes are painted, carefully peel the freezer paper off the top of the shirt. Now apply a thick coat of blue paint to one of your child's hands and stamp it in the upper left corner where there are no stripes. Let dry. Then peel off the paper from the inside of the shirt and put it on! Oh this is so cute! Thanks so much for sharing. I know my son will love making and wearing this! This looks so cool! Love the hand print! 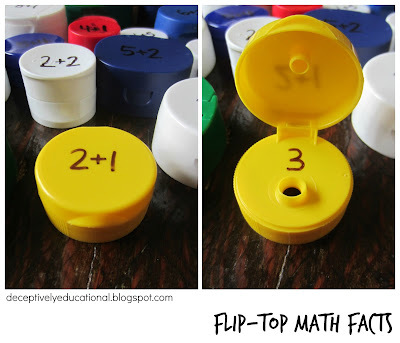 What a cute idea! I have pinned this post! If you don't have freezer paper, use painters tape (either green frog tape or scotch blue painters tape). Simply mask off the areas you don't want painted. 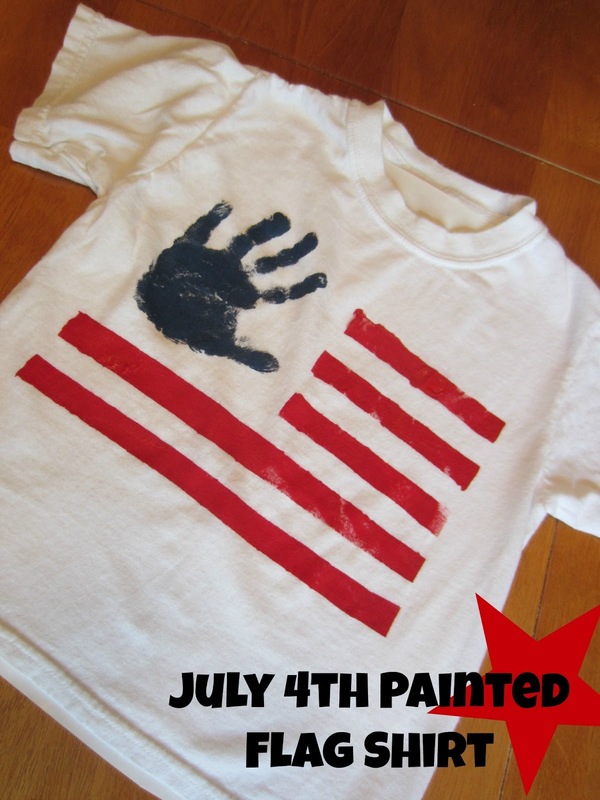 We did a flag shirt one year in VBS with masking tape and star stickers but I love the hand print! What type of paint did you use? I need to do this with my little girl! Look for paint in those small 4 oz. squeeze bottles at your craft store. They'll specifically say something like 'suitable for fabric.' I believe it was acrylic paint we used and I think the Martha Stewart line is okay to use on cloth. For the tshirts, do we have to use 100% cotton or can we use the 50/50 poly/cotton blend shirts? Our shirts were 100% cotton. I'm sure 50/50 would work fine too. I'd wash first in both cases, though, unless they're pre-shrunk. Have fun!